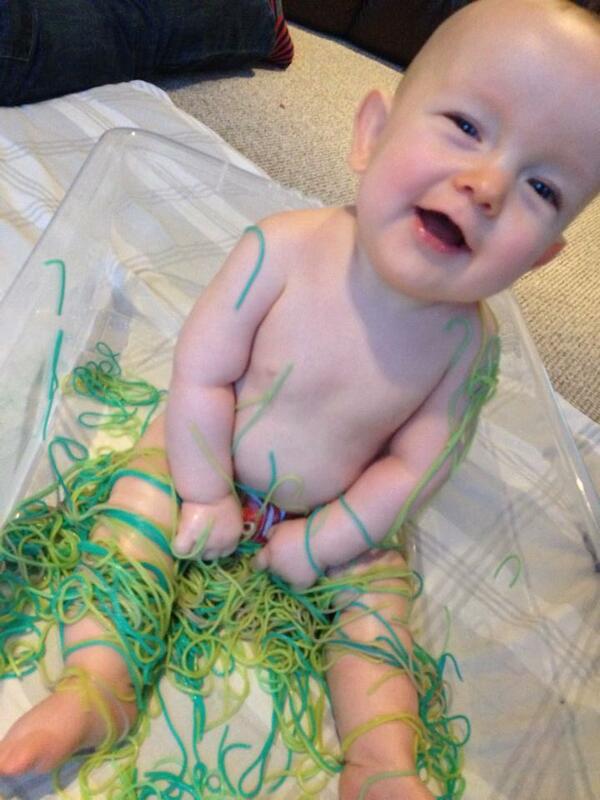 Messy play ideas for babies and toddlers. Following up from my previous post about the messy play we have done with Dexter, I have decided to make a list of our favourite messy play ideas so that I can keep them all together. Feel free to share some of your ideas with me or share this post with your friends. For most of these I recommend a tuff spot/oil tray or something similar like a baby bath or small paddling pool to contain the mess. That way its easily washable afterwards. Other suggestions are under-bed storage boxes, washing up bowl or even your bath tub. If you don’t want to sit little one in the mess you can always put it in baking trays or similar and let them just put their hands in or even use their high chair trays. Cook Spaghetti as normal and then separate into different portions, as many portions as you have colours. Add a few drops of food colouring to each portion and mix. Add more colouring in drops until you reach your desired colour. Chuck it all in your tuff spot or tub and let the fun commence. (Make sure its cooled enough first and just be careful of the amount of colouring, it does colour skin although very lightly and washes off easy enough) Pasta can be kept in an airtight tub in the fridge for a week. Mix up jelly according to manufacturers instructions. For added bonus, put some of your child’s small toys in the mix for excavation fun. Allow to set in the fridge and them empty into a small tub or tray. To mix it up a bit, try making different colours or using different shaped moulds. Mix 4 cups of flour to half cup of cooking oil (vegetable/sunflower) You can double this if you want to make more. Again add food colouring if you want to and then just mix it all together. when your done it should be a mouldable consistency similar to that of moon sand. You can also add glitter. 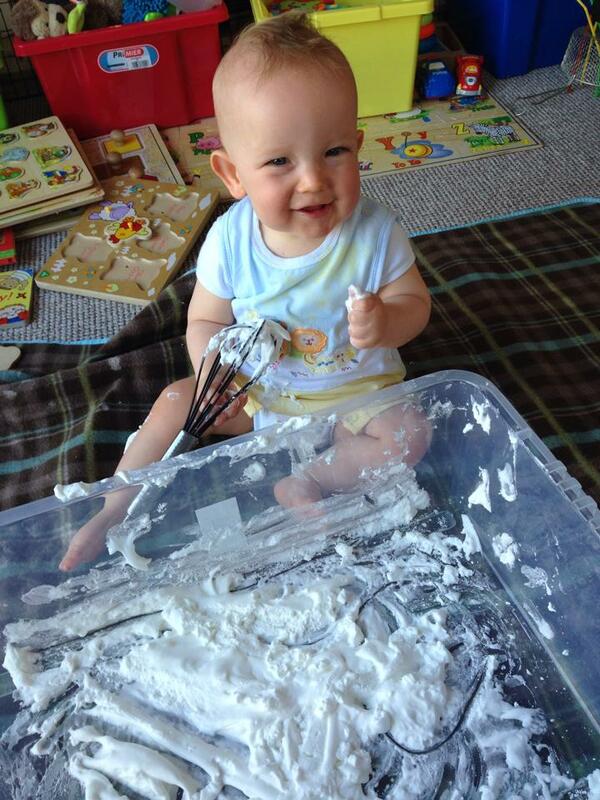 Mix shaving foam with flour. as above you can mix in some glitter for sparkly clouds. You could do some colour mixing with this one and make a couple of sections with the 3 primary colours (red, yellow, blue) and see what happens when you mix them all together. What other colours have you made? One of my all time favourite messes as a child. Take equal measures of cornflour and water. Slowly add water to the cornflour (not the other way round) and mix to the desired consistency. It should be solid when patted but liquid when just touched. If you grab a handful and squeeze it hard it will go solid in your hand for a second before seeping through your fingers. Such a bizarre substance but one that keeps you intrigued and playing. Fill a tuff spot with a selection of various dry ingredients such as porridge oats, pasta shapes, lentils, beans, peas, flour, rice, shredded paper etc – whatever else you may have in your cupboards. Even things like cheerios. All will have different textures, shapes, smells and tastes so will be very interesting for younger ones. For older ones you could add some toy cars or farm animals, dinosaurs and pretend its different landscapes for some small world play and exploration. The possibilities with this one are endless. Separate some dry rice into different food bags and add a few drops of food colouring. Shake the bags around for a while until the rice is coloured. Pour into different areas of tray and allow the child to mix it or mix it all together before hand. Again this can be used with other toys such as cars, trucks and diggers or with fairies and princess dolls to make a fairy land. Use your imagination. If you make enough colours you could set it out as a rainbow before your child gets their hands in. Once its you’re finished with it, it can be poured into an empty, dry, clear bottle to make a lovely sensory bottle or rainbow rain shaker. 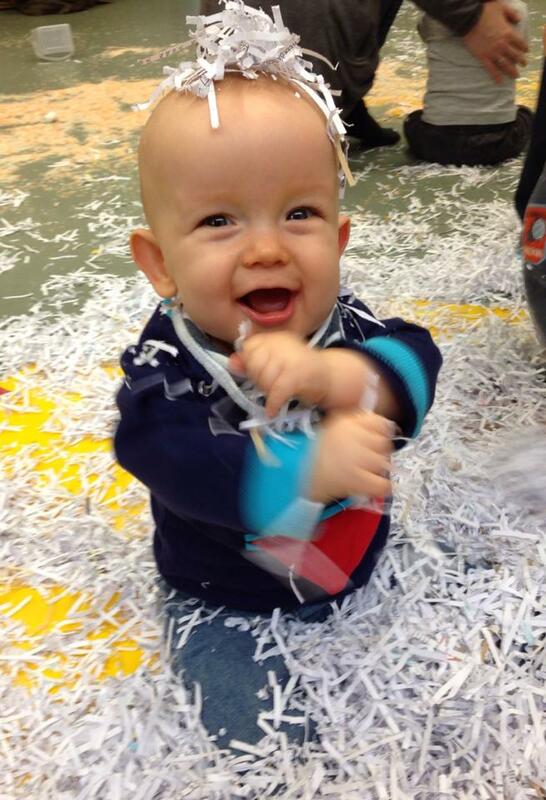 Why not get some fun out of all those boring bank statements we sit for hours shredding up. Empty paper shreddings in to a large tub. You can hide the child in and let them dig their way out or you can hide some of their toys and let them search for them or even just let them crawl through it. Just watch for staples. Different coloured papers will make it a bit more interesting. Can be used plain and just squirted out or can be mixed with cornflour and/or food colouring(as above). If you add food colouring tho, just put random drops in various places and let the child mix it themselves. Add glitter for extra fun. 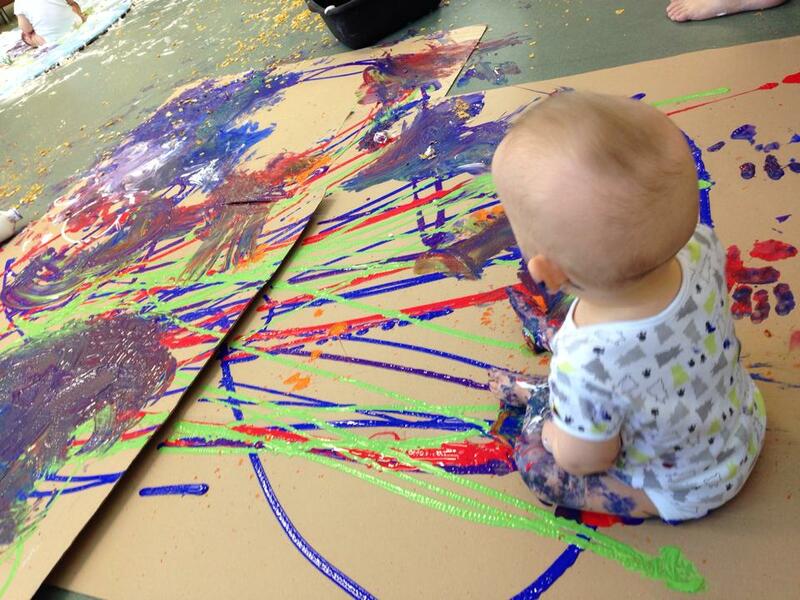 A couple of squirts of poster paints (non-toxic) into a large tub/paddling pool or on your little one’s high chair tray. Let you little one just smush it around and see what happens when some of the colours mix. This is a great opportunity for hand prints and foot prints too. Pour water into ice cube trays but add some food colouring before popping them in the freezer. Once frozen you’ll have some lovely coloured ice. Put little one in a tub with water or paddling pool/bath tub and let them chase the ice around as it melts. Freeze water in different shaped/sized containers and add some of your child toys. They will have great fun trying to free their toys as the ice melts. This can be done in the bath tub/paddling pool too. Have I missed anything really obvious? 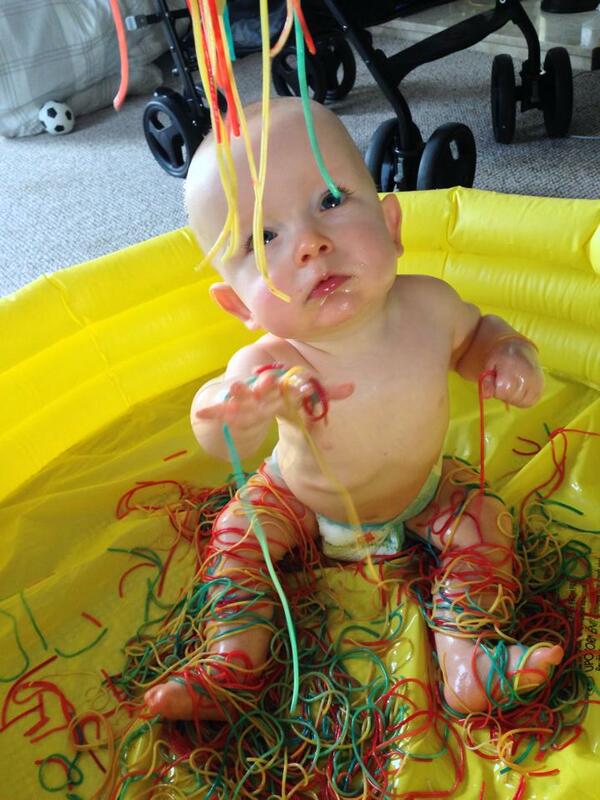 What are your favourite messy play ideas? Let me know in the comments. Maybe we’ll give them a go. Thanks 🙂 We do too! Haha glitter gets everywhere in our house! Including on the baby (whoops)! But yeah, I really recommend using the bath. It makes cleaning afterwards so much easier.